Do you have a bike in the shed that needs a little attention before you can ride it? Maybe its got a puncture and you don’t feel confident about fixing it, or perhaps the chain has fallen off? 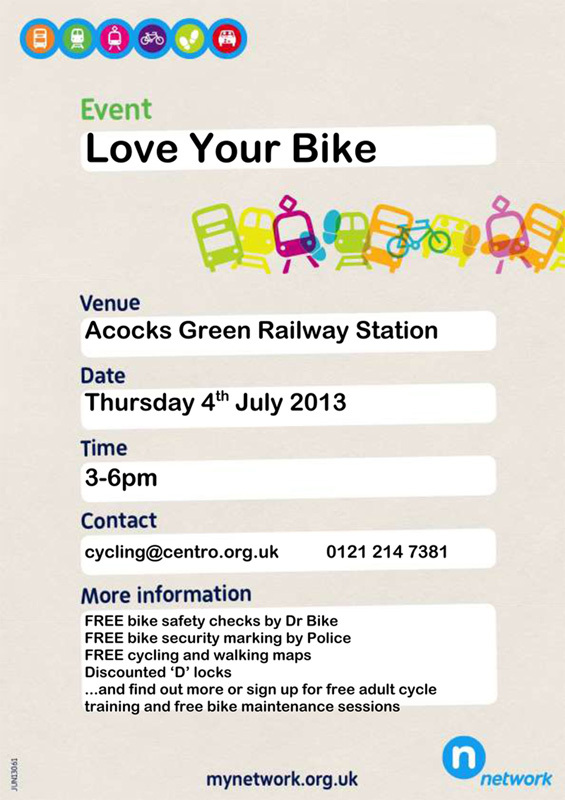 If you can get yourself down to Acocks Green train station this Thursday between 3pm and 6pm then help is at hand from Dr Bike. There will also be security marking and useful information for all those keen on cycling more and reaping the benefits that go with riding a bike. See below for all the details. Spread the word… Dr Bike is here to help. This entry was posted in Events and tagged Acocks Green, Acocks Green train station, bikes, Centro, cycle lessons, cycle maintenance, Dr Bike, punctures, security marking. Bookmark the permalink.